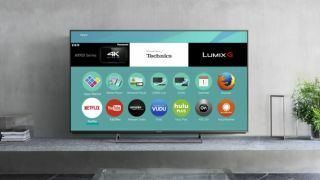 Perhaps the biggest trend with Panasonic’s lineup of TVs this year (aside from the company’s full-on embrace of OLED technology) has been the loss of Firefox OS. Its demise began back in December 2015 when its developer Mozilla announced that it would no longer be developing the smart phone version of the operating system, but the final nail in the coffin came in September last year when the company ceased all development entirely. Its demise is unfortunate. In our guide to the best smart TV platforms we called it “the best-looking and most easily customisable smart TV platform around,” and so its loss really is a shame. The end of Firefox OS could have proven awkward for Panasonic, but from what we’ve seen of the 2017 lineup the company has successfully rolled with this particular punch, and has now fully taken over development duties itself. The result is the loss of Firefox TV branding entirely in favor of Panasonic's own ‘My Home Screen 2.0’, which was previously co-developed with Mozilla. The OS features in the company’s mid to high-end ranges this year. Lower-end ranges feature the first version of My Home Screen. The company was able to achieve this transition thanks to Firefox OS being open-source, meaning its code was freely available to edit by anyone. My Home Screen 2.0 is essentially a 'fork' of the old OS, which is a term used in the open-source community when a new developer comes in and makes their own version of an existing project. As well as a change in name the operating system has also seen a few improvements made. New this year is the ability to organize apps into folders. If you’re the only user of the TV you might group film streaming apps or television streaming apps together, or if it’s used by a family you might group apps based on who in the household uses them. Photo and video organisation has also been improved. The bottom line is this. Although Firefox OS is dead, Panasonic so far has been more than capable of continuing its excellent legacy. Apps are still being added with new functionality (such as the YouTube app which will shortly be 4K/HDR compatible), and Panasonic is continuing to develop the operating system. The biggest loss as far as we’re concerned is that if Panasonic is handling development in-house, then this removes the possibility of this excellent operating system coming to other manufacturer's televisions. Panasonic’s new flagship is running My Home Screen 2.0, check out our hands on review of the Panasonic EZ1002.